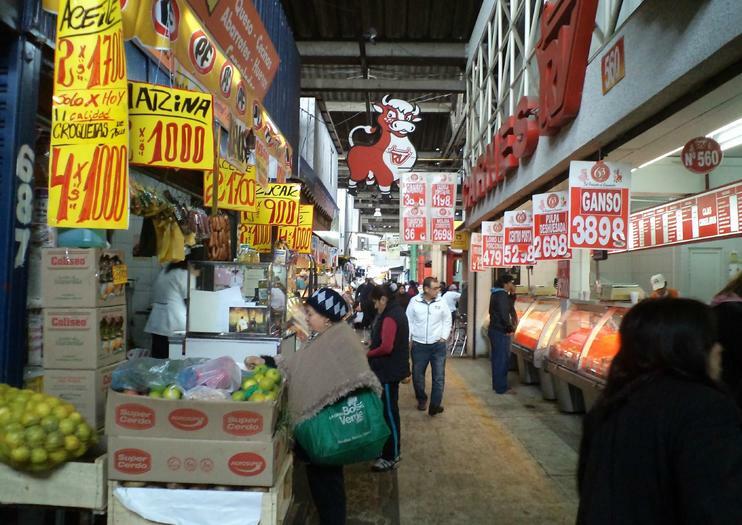 Santiago’s principal market, La Vega Central is a chaotic, colorful snapshot of daily life in the Chilean capital. Housed in the salmon-colored Mercado Central and bustling with locals and travelers alike, La Vega is one of the most vibrant places in the city to pick up fresh, seasonal produce and try local cuisine. Traversed by hundreds of thousands of visitors every day, La Vega Central is a must-do for foodies; however, exploring the market on your own can be overwhelming and disorienting. Opt for a group or private tour guided by a local who can point out the best stalls. Many culinary biking and walking tours include stops at La Vega, and some cooking classes source produce from the vast market. - La Vega Central is massive. Join a tour to get the most out of your visit. - Watch your valuables, and wear nonslip shoes, as the tiled floors are sometimes slippery. - The market is accessible to wheelchairs and strollers, although crowds, slippery floors, etc., can make it challenging to get around. - Unlike in some other parts of South America, vendors in Chile generally don’t haggle over prices. La Vega Central is located in Santiago’s Recoleta district, a short walk from the Patronato and Puente Cal y Canto metro stations. Access the market from the entrance on Calle Artesanos or Calle Antonia López de Bello. La Vega Central is open every day, year-round. The market is most active in the morning—for the best selection, get there early. Some stalls close by mid-afternoon. The stock at La Vega varies depending on the season. Look for chirimoyas (custard apples), lúcumas (rich, nearly dry fruits that make excellent smoothies), bayas de maqui (berries that some consider a superfood), and tunas (prickly pears). Chilean paltas (avocados) are also plentiful and delicious. An offbeat walk where the only thing that will be to the beat is the sound of our feet. Together we discover Santiago’s fresh fruit, veg, fish (and everything in between) market. Our feet bounce off the tourist path and we will interact with true Chilenos as they hustle over the capital city, tasting, smelling, bartering and bantering. Are you a wanderer with an inkling for excitement and enthusiasm for culture? This tour will fill your inner desires. This tour’s grand finale is a visit to El Cementerio General (Santiago general cemetery)… We told you this is not your average tour! But we’d be loco not to share this wonder with you. A tour where you should expect the unexpected and discover what it is like to be a Santiago local. Charge your camera and slap on some sunscreen friends! A personal tour for life’s culture seekers! This is a gastronomic experience where you will have the possibility to discover the culture of our country through its cuisine. During the Half Day Tour, we will visit the traditional markets of Santiago and cook some typical dishes of the Chilean gastronomy. The National Geographic Traveler magazine chose the Central Market of Santiago as one of the best in the world. Within its Top Ten list, the Central Market is exactly located in the fifth place.We have listed the 45 best markets in the world and La Vega Central in Santiago was mentioned in place number 4. An unforgettable route through the history, architecture and gastronomy of Santiago.We will visit the historic center, a sector that stands out for concentrating the largestamount of the city's heritage, where political, social and urban tales have beenhappening for more than two centuries. We will taste all what is good and typical fromSantiago ́s downtown.